Q. What is the "Nebraska Safe Boating Certificate"? A. The Nebraska Safe Boating Certificate (also referred to as the Nebraska boating license) is proof that a boater has taken and passed an approved boater education course. 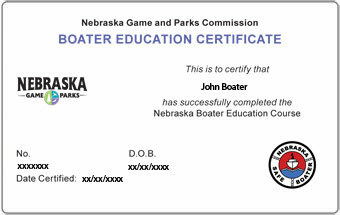 The Nebraska Boater Education Card is good for life and does not need to be renewed. Q. Do I have to get the Nebraska boaters license? A.Nebraska law requires any motorboat operator (including personal watercraft) born after December 31, 1985, complete a Boating Safety Course and be in possession of a course certificate when operating the boat. You must be at least 14 years of age to operate a motorboat (including personal watercraft) in Nebraska. For more information, please consult the Nebraska Boating Laws and Regulations page. A. The boater education card is proof that you have successfully completed a boating safety course. The boater education card does not expire and does not need to be renewed. Therefore, it is NOT a Nebraska Boating License! Q. I do not have a driver’s license. Can I still get the Nebraska Boater Education Card? A. Yes! You are not required to have a state driver’s license in order to obtain a boater education card. Q. How do I get my Safe Boating Certificate? Print a temporary card immediately and receive your permanent card in the mail within 3-5 weeks. Q. How long is the boat safety course and card good for? A. The certification is good for life. A. There is a one-time fee of $29.95 paid to BOATERexam.com®. A. You need a grade of 75% or higher on the boating license test to pass. That means 45 correct answers out of 60.